Chronic rotator cuff tendinopathy and tendinosis (CRCT) are common disabling conditions in people who often engage in repetitive overhead reaching, lifting and pushing with overstretched arms. It happens when the muscles and tendons that surround the shoulder joint are inflamed or irritated. While CRCT is caused by overuse, acute rotator cuff injuries can happen when you lift something heavy or fall on your arm. • Repetitive stress – repeating the same shoulder motion can stress the muscles and tendons of the rotator cuff. Baseball, swimming, tennis, cricket, weightlifting, and rowing are some sporting activities that can put you at risk for rotator cuff injury. Occupations such as painting and carpentry can also damage the rotator cuff over time. • Lack of blood supply – as you age, your tiniest blood vessels die, causing a reduced blood flow to body muscles and tendons. A decrease in the blood flow to the rotator cuff tendons affects the body’s natural ability to repair damaged muscles and tendons. This can ultimately lead to a tendon tear. • Bone spurs – a bone spur is a bony outgrowth that develops around your joints. As you lift your arm, the spurs rub against the tendon of the rotator cuff. Over time, the spurs weaken the tendon, making it more susceptible to tearing. Extracorporeal shock wave therapy (ESWT) is a clinically proven and highly effective treatment for chronic rotator cuff injuries. It involves the application of either high-energy or low-energy shockwaves to the rotator cuff. The shockwaves cause small disruptions of injured tissues and encourage blood flow in the surrounding areas. This promotes the regeneration and reparative processes of the muscles, tendons, and bones. 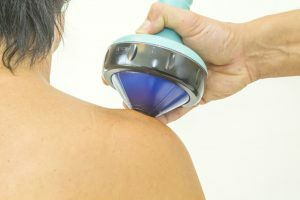 The therapy has become a very popular technique for treating chronic rotator cuff injuries for several reasons. It is a non-invasive procedure meaning you can return to work or continue playing sports immediately following the treatment. The therapy is also effective in reducing pain – most patients experience pain relief for at least two to three weeks after the procedure and many for months. You may require three to six therapy sessions depending on the extent of your injury. If you have a sports-related injury, shockwave therapy may be a great treatment option and could reduce the pain and help you regain normal function. Call us today at 9144-1510 to schedule an appointment with one of our physiotherapists.